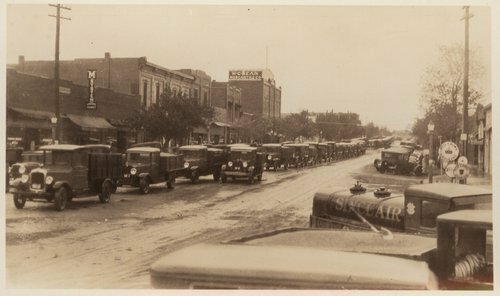 This photograph shows a long line of grain trucks lined up on Main Street in Cimarron, Kansas. They are probably bringing wheat to an elevator during harvest. A number of business buildings are visible. These is an Sinclair Oil tank truck in the right hand corner of the image.